Canada: 1851, 12d. black an unused horizontal pair from the foot of the sheet. 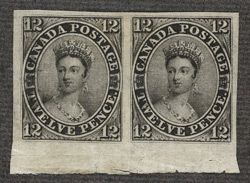 bl.uk > Online Gallery Home	> Online exhibitions	> Philatelic rarities	> Canada: 1851, 12d. black an unused horizontal pair from the foot of the sheet. The first issue of stamps for the colony of Canada was made in 1851 and comprised 3d., 6d. and 12d. values. One shilling was not used as the face value as it had in local currency more than one meaning of value. In New England 1/- meant sixteen and two-thirds cents which was equal to 10d. In New York shilling meant twelve and a half cents equalling seven pence halfpenny. Thus twelve pence offered no misunderstanding. Out of 51,000 of the 12d. black that were printed about 130 copies are believed to exist today and only five unused pairs.